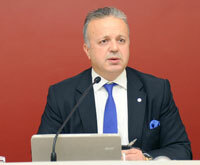 ICI Chairman Bahçıvan: “Industry Has the Lion's Share in Turkey's Growth"
The Istanbul Chamber of Industry (ICI) Assembly held its final ordinary meeting with the main agenda item entitled "Expectations for 2015 from our Industry and Economy as We Conclude 2014". Budget for 2015 was approved during the assembly meeting, chaired by İsmail Gülle, Deputy Chairman, ICI Assembly. Erdal Bahçıvan, Chairman of the Board of Directors of ICI evaluated the performance of the industry throughout the year and shared his opinions on the upcoming year. He stated his expectations that the new year will be brighter than 2014 for Turkey and added "If the recovery in the global economy makes progress, our country will also reap the fruits of this development. Improvements in the current account deficit and inflation may lower our costs and accelerate our investments to a certain degree." Bahçıvan also stated that the Turkish industry increased production and contributed substantially to economic growth despite challenging circumstances in 2014: "Our industrial production index rose by 3.8 percent between January and October. One out of the 2.8 percent growth in the first three quarters of the year comes from the increase in added value of the industrial sector." 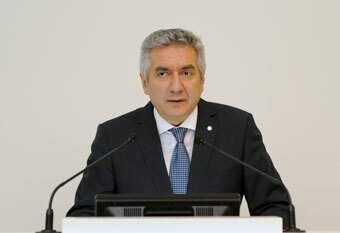 Bahçıvan drew attention to how better-performing exports created a positive impact for improvement and that industrial sector exports have increased by 5.4 percent despite the stagnation in the Eurozone, the effects of the Russian-Ukrainian crisis and the developments in Iraq and Syria in our region. He added that a more competitive Turkish Lira compared to last year also helped boost exports. “Concerned about the transfer of closure of Inward Processing Regime documents"
"I would like to draw your attention to a development that is of concern to our exporters in addition to our narrowing export markets, Euro-based negative developments due to cross rate, turnover loss due to unit prices of basic raw material inputs. The reason of concern is that the Ministry of Economy will be handling the Closure of Documents for the Inward Processing Regime. This regulation will increase the problems recently faced by our exporters in customs. We should also pay attention to how intensified red tape will bear the risk of loss of momentum in our exports. In a challenging global climate where even a single dollar appreciates, it is of paramount importance for everybody to avoid any act that would slow down our economy and demoralize our industrialists and exporters due to competition and conflicts between institutions. Bahçıvan also touched upon the importance of implementing the Economic Transformation Programs and action plans announced by the government with a determined, transparent approach and in strong cooperation with all stakeholders, primarily with industrialists. "Once this is achieved, we believe that we will accomplish the transition to a growth model our country needs; one that is production-oriented, sustainable, raises the welfare level of the society and improves income distribution and thus we will become a global actor. Trust and stability precedes all, for the benefit of economy and investments. A glance backwards reminds us the heavy price we paid by detaching ourselves from the outside world, focusing on the inside and wasting our energy in unavailing internal feuds. Solving problems with an eye to social peace and within legal boundaries should be essential for all of us if we are to not pay the same price. Bahçıvan also laid emphasis on avoiding populist discourse and actions regarding the general elections to be held in June 2015. He concluded his remarks by wishing peace, abundance, health and happiness for the world and for Turkey for the New Year.